Preflight Inspection - Does Your Instructor Join You? During my student's preflight inspection the other day, I was thinking to myself about how so many of my other instructors never bothered to come out and join me, until it was time to hop in the plane and go. I don't want to come out and say that if your instructor doesn't join you and help you out on your preflight inspection that he/she doesn't care. What I will do is tell you why I DO. First, I don't want the student to feel like I'm just there to put in my hour or two, and tally up my hours. I always liked it when my instructor came out with me to help me out with the inspection. It gives you a feeling that you fully have their attention, and they are concerned about the lesson. One of my pet peeves has always been when my instructor sends me out to do the preflight, when all they are doing is just standing around the FBO, shooting the breeze with other people. Or when it is really cold out, and they just don't feel like getting chilly. No I admit, preflight inspections can be uncomfortable when it is below the freezing mark, but if I go and help out my student, it goes a little quicker, and we can fire up the engine and get the cabin heat going that much sooner. With all that being said, here is the REAL reason I join my student for the inspection: I want to make sure it is airworthy, because my life depends on it. My body will be in that airplane just like my student's will be, and I want to check everything first hand and make sure it is in good shape to fly. After all, these are STUDENTS that I'm flying with. Students are prone to miss things. Not that I'm not, but if there are two eyes checking everything, it gives us a much greater chance to catch anything that should prevent us from conducting a safe flight. Once again, if your instructor doesn't always join you on your preflight inspection, it doesn't make them a bad instructor, so don't go and confront them about it. I'm just telling you why I do. I'd love to hear comments. During an instrument lesson with one of my students a couple weeks back, he asked me an interesting question while shooting the LOC BC RWY 23 approach into KHUF. If you look at this approach, obviously it is a localizer back course approach, but his question was concerning the final approach fix. When you look very close, you will notice that the FAF is defined by the VOR station passage. The VOR happens to sit off away from the back course of the localizer, slightly to the left about 1/8 of a mile or so. In the 172s we fly, we have dual VOR receivers. So to set up for this approach we must set our CDI 1 to track the localizer, obviously. But to assure that we can identify the FAF, we must set our CDI 2 to get the TO/FROM flip, which identifies station passage, and the FAF. At this point, we start our time, and descend to our MDA of 980 ft. So anyway, my student's question was this. "It doesn't matter what I have the #2 CDI set on, because I'll get the TO/FROM flip no matter what, right?" I then told him no, and that it had to be set up on the final approach course, because you'll get a good clean and fast flip that way. But then I thought, wait a minute, is that right? 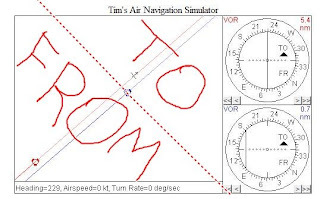 That night I went home on got on my trusty little tool, Tim's Air Navigation Simulator, to experiment with this matter. I hadn't studied how this worked in a while, so it was time for a good refresher. Turns out I was right, you do need to set the #2 CDI to match your final approach course, but here is why. I learned that whatever course you have your CDI set up to, the TO/FROM flip occurs when you pass an imaginary line perpendicular to your dialed in course. For instance, here is our setup on this approach. You can see, we have our avionics set up to simulate the LOC BC RWY 23 approach that we were practicing that day. We have the CDI 1 representing the localizer back course final approach course, and the VOR (FAF) in the CDI 2 just adjacent to the approach course. The lines indicate the radial we have tuned in. This next picture will show some drawing by me indicating with this setup on the avionics, where you will get to and from indications on the #2 CDI. The solid lines indicate the radials we have tuned in, but the dashed line indicates where we will get a TO/FROM flip. As you can see, even if you are slightly off course, you will still get a flip. In fact you will get a flip anywhere you cross this dashed line, even if you are not on the dialed in radial. However, let's say that we weren't paying attention to what we had our CDI 2 set on, and we left it on say a 320. Let's take a look at what that scenario would look like. You can see that you would never get a flip on this setup. If you tracked the localizer all the way in, with a 320 set up on #2 CDI, you would have a FROM indication all the way in. Let's say you had #2 set up on a 140, and you happened to drift off course before you hit the FAF. You would actually get a TO/FROM flip way before you crossed the VOR. Bottom line is this. 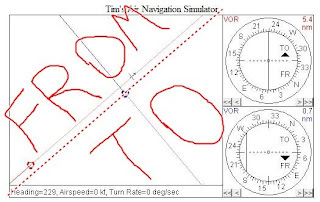 Any time you are identifying the FAF by an off course VOR, make sure you have the the published final approach course dialed in on all avionics so you get a TO/FROM flip at the right spot. Do you have an easy way to remember the required tests and inspecions for IFR flight? Any time we are required to use rote memory to remember academic material, acronyms are a useful tool. I just came up with one while looking through the Instrument Oral Exam Guide from ASA for the required tests and inspections before we can legally fly IFR. Here you go. A1ATPVE. Kind of has a ring to it. Here's what it stands for. A-Annual inspection every 12 calendar months. 1-100 Hr inspection every 100 hrs if flown for hire. A-Altimeter inspection every 24 calendar months. T-Transponder inspection every 24 calendar months. P-Pitot/static system inspection every 24 calendar months. V-VOR accuracy test every 30 days. E-ELT battery every 12 calendar months. There you go. Just remember A1 Sauce, Airline Transport Pilot, and I don't know anything for the VE. Let me know if it works out for you. On a lesson a few weeks ago, I decided it was time to introduce one of my instrument students to IMC (Instrument Meteorological Conditions). It rained on and off all day long, and the ceilings were hanging around the 1,000 ft mark, give or take 200-300 ft.
By about the time our lesson rolled around, there was a pretty decent break in the weather and the ceiling consistently remained around 1,200 ft. There was very very light rain falling at the time, and the radar showed just very light stuff in the vicinity of the field. I figured these would be good enough conditions for him to get in some practice approaches and if need be I could take over if he got flustered with being in the clouds. We filed IFR, conducted our preflight, got our clearance and took off. Then wouldn't you know it, we got up there and ATC comes on to tell us that visibilities have reduced to 1/2 mile and the ceiling had dropped substantially (I think to around 500 ft). Also our flight school Chief CFI had called our approach facility and gave us instructions to land because these conditions were below the minimums for the flight school (1,000 & 3). Now granted, this was far from any sort of emergency situation, but at that point, I knew that this was no longer a training flight. This was real IFR, and we were no longer doing "practice approaches." I took the controls after ATC told us to abandon the VOR approach we were doing and gave us vectors for an ILS. My student was doing fine, but I wanted the controls at that point. The point of the story is that "practice approaches" in IFR conditions are not practice approaches at all. They are the real thing. Now I do think it is definitely important for all instrument students to see IMC as much as possible before the checkride, because it is a lot different than being under the hood. Just remember that when you actually file IFR and get up in the clouds, it's time to step it up a notch or two, because this is the real deal. Make sure you are in fact proficient on instruments any time you plan on getting in the clouds. Bottom line...IMC deserves our respect. A couple nights ago, while on a night cross country flight I was wondering what we would really do if we happened to lose our engine power. Strategy for putting a powerless plane down at night is a subject that is rarely discussed, which is why I thought it would make for a good topic of discussion. I can't write about this topic without stating up front how extremely rare that complete and unpreventable loss of engine power is at any time, let alone at night. However, it is something we should be prepared for in case it does happen. There is of course a classic saying one of my professors always said when referring to an emergency landing at night, and I'm sure it has been quoted by many an aviator over time. "Flip your landing light on, and if you don't like what you see, turn it off." Makes for a good chuckle of course, but seriously, what is a good strategy for engine out operations at night. A question like this, as well as any other, should always start with a search through the FAA publications to see their take on it. The Airplane Flying Handbook (FAA-H-8083-3) discusses this subject of Night Emergencies at the end of Chapter 10. First of all, it states that just like any other engine failure, the first thing you should do is maintain positive control of the aircraft and pitch for best glide speed. It then states that that you should attempt to determine the cause of the failure, attempt a restart, and communicate your emergency with ATC if unable to restart. Again, this doesn't vary from what you would do any other time. The extra considerations for night conditions come in when they mention the following recommendations. If the condition of the nearby terrain is known, turn towards an unlighted portion of the area. Plan an emergency approach to an unlighted portion. Consider an emergency landing area close to public access if possible. This may facilitate rescue or help, if needed. Complete the before landing checklist, and check the landing lights for operation at altitude and turn ON in sufficient time to illuminate the terrain or obstacles along the flightpath. The landing should be completed in the normal landing attitude at the slowest possible airspeed. If the landing lights are unusable and outside visual references are not available, the airplane should be held in level-landing attitude until the ground is contacted. Those are the FAA's guidelines so let's take a close look at what they are getting at exactly and then I'll throw in my 2 cents. They say if you know the condition of the terrain, aim for the unlighted portion. The key words there are "if it is known." What if you don't know the condition? You may be aiming for a forest, when a perfectly lit street is close by. On the other hand, if you know there is a nice level field underneath you, by all means use it. Landing close to public access is important also. What if you needed medical help after landing? This could mean the difference between waiting two hours for an ambulance or 10 minutes. That could be the difference between life and death. I would immediately turn the landing light on as soon as I knew I had to put it down. The sooner you can see any obstacles, the sooner you may be able to take action to avoid them. I'm also a firm believer that being a safe and smart pilot is all about leaving yourself as many outs as possible. An out is simply a way out of something that is hazardous or has the potential to become hazardous. For instance, a way out of icing conditions may be the ability to climb above the clouds. A way out of thunderstorm hazards may be the fact that you are staying out of the clouds to increase your ability to see and avoid them. The cold hard truth is that when you fly at night, you simply lose one of your biggest outs: the ability to see the surface of the Earth so you can choose your landing spot more wisely. Knowing this, what can we do to possibly improve our odds in addition to what the FAA recommends? Here's my advice. Pick a high cruising altitude. This will give you more time to troubleshoot and a greater gliding distance, possibly to an airport. It also wouldn't hurt to choose a route which takes you over or near several other airports along the way. If the engine did fail, wouldn't it be nice to know you had an airport underneath you? Also use VFR flight following or go IFR, even if in VFR conditions. ATC may be able to vector you to a good landing spot. I hope this sheds some light on the subject and if nothing else, gets you thinking about what your strategy would be for night engine failures. I'm not trying to scare anyone out of flying at night, because I think it can be some of the most pleasant and enjoyable flying that there is. But we always must know that potential hazards that exist whenever we take to the skies, no matter what the conditions. When cross country flight planning, I know that it can be a little overwhelming at times. Between calling for briefings, filling out the nav log, filing the flight plan, familiarizing yourself with the destination airports, and so on, it can get a little hectic, especially when you're trying to cram it all in in a short period of time. Way back when, after I got my instrument rating, and I was really trying to build up cross country time for my Commercial, I decided it would be a good idea to develop a cross country planning checklist. I mean, why not? We use checklists for flying the airplane. It only makes sense to make a checklist for this workload intensive task before we hop in the plane. Besides I needed something to help simplify the process. We use checklists to make sure we don't leave anything out, and that's exactly why I developed this. I give this to my students, and believe you all should use one as well. Here's the one I use and in this order. 2. Select destination based on weather conditions. 3. Select most practical route (check for IFR preferred routes). 4. Check NOTAMs for navigational aids to confirm the flight can be completed according to the selected route. 5. Select checkpoints, measure distances, and fill in navigation log. 6. Fill in true course figures, for all segments of flight. 7. Study weather charts to obtain a thorough understanding of current and forecast weather conditions. 8. Select cruise altitude considering winds aloft, cloud tops, freezing level, turbulence, PIREPs, etc. 9. Obtain weather briefing from Flight Service and make go/no-go decision. 10. Determine alternate airports(s) if necessary. 11. 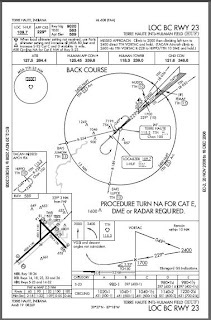 Become familiar with airports of intended landing, with information such as runway lengths and slopes, communication frequencies, airport elevations, traffic pattern altitudes, equipment required for airspace to be entered, etc. 12. 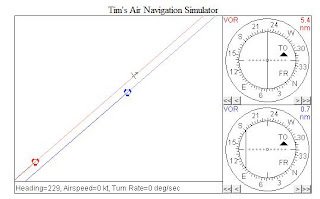 Calculate course heading(s) and ground speed(s) and fill in navigation log. 13. Calculate density altitude, takeoff and landing distances, weight and balance, and necessary performance figures from charts. 14. 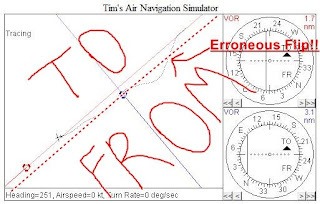 Fill in remaining times to calculate time enroute, and select point to start descent. 15. Calculate total fuel burn and fill in navigation log. 16. File your flight plan. Phew! There you have it. There really is a lot to do before a cross country flight isn't there? Yes, there is, but you know what? This is the right way to do it. Never forget the importance of all of this planning. Of course it can be a bit tedious, but if things start to go a little sour in the air, you may end up being sorry you didn't plan sufficiently. Print this off and use it. Modify it and put in your own notes if you wish, but make sure you get this stuff done one way or another. When you get in the cockpit, you'll feel confident and more ready to handle any sort of curveballs that should arrive. Good luck and have fun. Cross country flights are why we learn to fly and are my favorite part of being a pilot. So long! That's right, if you have not made it a point to take a tour of your local control tower (if you have one), you need to look into doing this. I just took one of my students up to our local tower and TRACON facility yesterday, and it was downright impressive. With security the way it is nowadays around airports, I'm not sure if everyone out there would even be able to do this or not, but definitely check into it. Ask around your airport if anyone else has been to the tower before. I have the luxery of working at an airport that serves a flight school, and there isn't any airline traffic at our facility. Therefore our controllers are very encouraging to us to visit so we can see how it all works up close and in person. Our freindly host (a veteran controller at KHUF) showed us around the tower, explained a little bit about what seemed like the 50 computer screens, talked to us about handoffs from approach to tower and other facilities nearby, explained the tower radar screen, and more. The coolest part was that he did this all while working and talking to aircraft on the radios!! Then we got to go down to the TRACON room. (Our airport is Class D, but also has an approach facility, that usually coincides with Class C). There were three big radar screens with each of them occupied with a different controller, and like the tower, many many computer screens with various information. I could have sat there and just watched them do their work for about an hour or two just because it was that interesting. The main point is that it gave me a tremendous new respect for what these guys do for us, and it was really cool to get a glimpse into this whole other side of the aviation industry. Go visit your local tower today! Just like MS Flight Simulator, there is another useful tool you can use if you don't have the setup to run MSFS. This one is just a bare bones, basic navigation simulator that you can use on your computer, and a few keys on the keyboard. 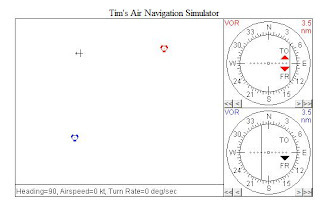 It is called Tim's Air Navigation Simulator, and you can access it here: http://www.visi.com/~mim/nav/. I've used this many times while working on my instrument rating and CFII. It has really come in handy. You basically fly the plane with the arrow keys on your keyboard, and you have two instruments that you can set to be a DG, HSI, RMI, CDI, or ADF. You can practice VOR and NDB procedures for basic instrument work. I really like to use it when practicing holds. You can even set a wind out of any direction and velocity. This is excellent to use for holds, and getting the hang of NDB navigation. I'm telling you, try this thing out. It is very useful. So long.